Pays des Collines—the land of the hills: it’s an area of hills just a few kilometers removed from the Oude Kwaremont. Ever heard of it? I had been to Flanders the last three years, but it wasn’t until this spring that I had ever seen the word written or uttered aloud. I, like many other pavé-addled cycling junkies that come to the Belgian church of cobbles, only had eyes for the hellingen that make up the myth of the Ronde van Vlaanderen: the Koppenberg, Oude Kwaremont, Paterberg, Muur, Taaienberg, and so many others. Why would I come to Belgium to ride paved road? I was always quite indignant on my insistence to spend my days on the cobbles, so exploration was never even a possibility. Everything changed for me on one fortuitous ride on a stereotypically Belgian spring day—that is to say, it was a cool, damp, foggy, gray day at the end of February. I met Bram through Strava, you know, the online cycling junkie dating service? We joined forces for the first time in Brakel at the giant cycling sculpture roundabout made of hundreds of old bikes—how romantic. From there, we headed south, chatting, getting to know each other. It’s always a little awkward that first time; you know your interests are the same, you even know that you like this person from the comments and emails you’ve traded back and forth, but that leap to a person-to-person experience is an amusing one. The roads he showed me that day were like nothing I could have imagined that morning when I set off from Oudenaarde on the N8. I passed hallowed cobbled ground on the steenweg (main road) that connects Oudenaarde to Brakel. I was thinking, expecting, yearning for cobbles, lots of cobbles. Instead, I got none. When I arrived home four and a half hours later with over 2,000 meters of climbing in my legs, I was excited. We left climb after climb after climb behind our rocking shoulders and slowly weakening legs—I think we did close to twenty that day—rarely anything wider than the width of a car, rarely a car to contend with. Forests, fields, winding roads, some steep, some gentle, all beautiful, greeted us at every bend. There were moments when it was hard to register that I was still within an hour’s ride of Oudenaarde—so, so close to the roads we all gleefully cheer about each spring, yet so far, so far that if you say the words Hameau des Papins or Bois des Frasnes or Mont Saint-Laurent, people will give you a blank, impatient stare. Cobbles—talk to me about the cobbles! I found that day and in the following weeks, however, that if one takes a small step back and leaves the cobbles behind (the horror! ), there’s a world that is—I don’t know if it’s possible to say this without being declared a Philistine—completely different, perhaps even better. If you look at a topographical map of Belgium, the semi-mountainous lumps of the Ardennes in the southeastern part of the country will jump out at you first, followed by what appears to be an otherwise flat expanse of farmland ending on the beaches of the North Sea. It’s a fair initial glance, but when you take a closer look, pockets of undulating terrain begin to show themselves, most prominently, the region near Oudenaarde sandwiched between the Schelde and Dender Rivers. The Flemish part of this hilly area is known as the Vlaamse Ardennen, and it’s on the many cobbled hellingen of this region that the winner of Belgium’s greatest race, the Ronde van Vlaanderen, is decided each year. The Ronde does a great job of showing off how great the area is; the helicopter footage from the race and the images that come out each year are gorgeous, almost of a different world. The cobbled lanes that tackle the steep hills at terrible angles are legendary—they’re a battle to get up, let alone race. The Ronde doesn’t take in all that’s special in this region though. In fact, after spending a number of months exploring every road I could get my bike on, I think it’s safe to say that while the climbs of legend are great, unbelievable, and entirely unique, there’s an even greater treasure to be enjoyed if you just divert your gaze from the rocks for a little while. I think the grail is combining the two, the cobbles and the small hills. Therein is my happy place. Going back to the map for a second, closer look, you might notice that the there’s more to this area of hills than just the Vlaamse Ardennen. The hills continue south into the French-speaking part of Belgium, into Wallonia. Here, the hills are given a new name, the aforementioned Pays des Collines. Upon arriving home after that baptismal day, I went straight to the computer to see where our ride had taken us, and the unfamiliar, foreign names began to ease their way into my conscious. Towns like Frasnez-lez-Anvaing, Flobecq, Ellezelles, Saint Saveur went from disregarded bla-bla-bla’s on the map to focal points. There was gold in those hills. They seemed so far away though, separated by this imaginary line, dividing Flanders from Wallonia, just south of what’s typically the southern boundary of the Ronde van Vlaanderen. The imaginary line that separates the Flemish-speaking north from the French-speaking south is about as imaginary as a punch in the face. There’s no intermingling of the languages, no buffer zone. Towns were cut in half with the line. The town of Kluisbergen sits on the border—one side is Kluisbergen, the other side is Mont de l’Enclus. We’re talking one step on either side. The line is known as la frontiére des langues for the folks on the southern side of the border and the taalgrens for the Flandrians. The differences aren’t limited to language though. When you cross over the taalgrens from Flanders into Wallonia, it feels more remote. The pleasant procession of houses and buildings of Flanders are replaced by more open fields and forests—more expanses of nothing. I had long thought this was just a factor of a smaller population, but I came to find out that it goes all the way down to building practices. In Flanders, structures are built along the roads—it’s called lintbebouwing—through the region. Travel just over the border however, and the practice is wholly different—there are clusters of houses and structures, leaving more blank space between towns, leaving more room for quiet. It’s hard to communicate just how close this all is from the roads most people who have visited the Vlaamse Ardennen have ridden before. Sometimes, they are just one road away. For many, we come to the hills of Flanders and seek only cobbles and the paved climbs that lead to more cobbled climbs, but if only there was half a moment taken from the bouncing jackhammer of a ride provided by the rocks, a moment to look up, you’d see so much more. The day spent with Bram romping up and down the hills of the Pays des Collines opened my eyes and showed me there was more to Flanders than what I had ever imagined before. Considering that I was already deeply in love with the area, this took me to an entirely new level of rapture. 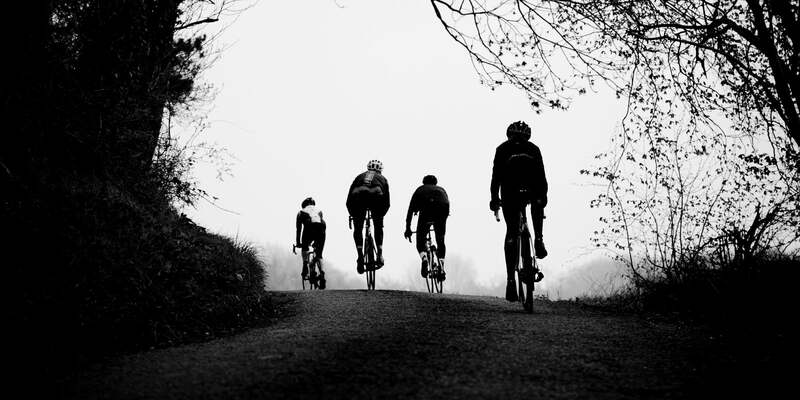 I could have everything in one ride, from the Koppenberg to the Bosrede and everything in between. It opened my eyes to the hills that were still in the Vlaamse Ardennen proper. There aren’t actually that many different hills in the area, there are a few prominent ridges, but it’s upon those ridges that countless roads are built. For every ridge, there are a dozen roads that climb it. Sometimes, there are half a dozen roads climbing to one specific point. Typically, only a few of those roads are of the used variety, meaning the rest are the equivalent of your own personal bike path through heaven. There are so many roads, so many climbs. I felt like an explorer each and every day I got on my bike, because there was always a new climb to go try out, another new road to enjoy as it wound seemingly randomly through the middle of a field. There have to be cobbles in the area though, right? This is Belgium after all. The cobbles are not a part of the experience of a ride in the Pays des Collines, but they can be, if only once. If the cobbled climb of Mont Saint-Laurent were picked up and moved twenty kilometers into Flanders, you would know everything about it. It’s a vicious, horrible climb that takes top honors in my book as the worst of all the cobbled climbs in Belgium. It’s not as steep as the Koppenberg, it’s not as long as the Kwaremont, but what it lacks for in outright steepness and sheer length, it makes up for by being plenty steep, plenty long, laid with wretched cobbles, and worst of all, it’s wide—it’s the crushing exception to the typical Pays des Collines rule: narrowness. Despite the 20%-plus gradients of the Koppenberg and Paterberg, there’s a sensation of forward movement brought on by the narrowness of the roads. You don’t realize how important that is until you’re on the climb of Mont Saint-Laurent. It’s wide—a superhighway of misshapen cobbles at an unfortunately steep angle—which all leads to one feeling: like you’re barely moving at all. Ever hear of Le Samyn? Quick clip from the 2013 edition. The area is far from unheard of. There are plenty of races that take in the roads just off the heavily beaten path of the Ronde. The beautiful, forested climb of La Houppe is often used in the semi-classics (it was in this year’s E3), but typically comes early in the day, so it doesn’t get too much attention. The Pays des Collines proper sees angry pedal pushers early in the season with the tough semi-classic, Le Samyn. The up-and-coming riders of tomorrow get a nice dose of the hills at the Triptyche Monts et Chateaux, which is based almost entirely in the area. Later in the year, the GP Pino Cerami and the Circuit Franco Belge give a nod to the region as well. If you ever get the chance to spend some days riding the famous climbs of the Tour of Flanders, do it. On your first one, spend the entire day enjoying only the cobbles, soak them in (if that’s possible) and marvel at their brutality. After that though, hit some cobbles on your way south and then spend some time exploring the quiet hills just outside of the web of the Ronde, and when you come home, rattle out a few more cobbled climbs to remind you why you came here in the first place. For me, that ride falls easily into my list of dream rides. I can’t wait to return to Flanders this autumn so I can pick up where I left off and join Bram for another day in the land of the hills—seemingly far removed from anything, but really just a ridge away from everything. From Issue 12. Buy it here.